Born at Assiniboia, Sask. 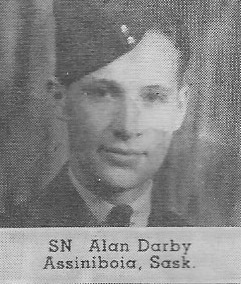 Attended Rockglen HS and St. Chad's College, Regina, where he was a theology student when he enlisted Dec 1941. His hobbies. were music, tennis, swimming and skating.Trained at Brandon, Dauphin, Mossbank and Regina. Overseas Oct 1942. Surv. parents Capt. and Mrs. GC. Darby, Regina, brothers Cpl. DA, PPCLI, Cpl. JS, RCAF and sister, Margaret, at home. Aucun article sur Sergeant Navigator (Bomber) DARBY n'a été trouvé dans les médias. Aucun document additionnel sur Sergeant Navigator (Bomber) DARBY n'a été trouvé.